FCL is an abbreviation for Full Container Load. FCL term is used in ocean freight service describing full container shipipng from on one place to another. FCL usually associates one shipper and one consignee. 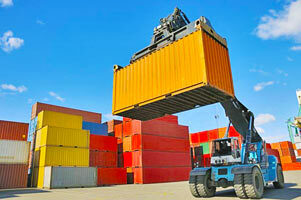 Full container shipping usually brings lower cost, than equivalent size and weight of cargo bulk. FCL is the most optimized container shipping way regarding cost, volume and weight of the cargo. The FCL (full container load) process involves - picking up empty freight container at the container yard, loading at the shipper facility, transporting by truck / rail to the port of loading and further sea / ocean container shipping of the cargo to the port of arrival and delivery to final destination. In certain circumstances of sea cargo transportation if you don't have enough cargo for a full container load we still recommend you to consider FCL option. You may find FCL sea freight service compared with LCL (Less than Container Load) to be more efficient, cost-effective, and convenient for you. For sizable ocean freight shipping FCL is the most appropriate choice for you ocean cargo transportation. No matter you make Import or Export, FCL sea shipping is safer and reliable international shipping way compared with LCL, Break Bulk and Ro - Ro. 1. Live Load FCL shipping – International moving company will deliver the FCL ocean container at your door. You will get usually two hours free loading time and if additional time is needed to load will be approximately at $60.00 an hour. We can palletize and crate your full container load cargo at extra cost however you may load and secure your personal goods in a sea freight container yourself. When you are finished loading and securing your cargo, the trucking company will sealed and return the full container load to the port of sailing and your ocean freight container will start its international journey. 2. Drop and Pick FCL shipping – If you need more time to load, block and brace your FCL cargo our International Freight Forwarding company can offer drop and pick service. If applicable, we will bring the sea freight full container load at your loading location for 2-3 days. When you are finished our international container shipping company will return the full container load back to the container shipping terminal. In general “Drop and Pick” service is really convenient FCL method and provides more time for the shipper to load and secure the cargo. However the inland cost at origin is twice as much as Live Load FCL method. When deciding to choose between Drop & Pick and Live Load, please consider the loading location from the sea port. If the loading location is distant from the sea port we advise you to consider Live Load full container load for the international export or import by sea. 3. Warehouse/Terminal Loading FCL shipping – For international moving we can provide you with complete bonded warehouse service. You can deliver your personal goods and vehicle to our warehouse facility or loading dock and we will provide the consolidation for you. Experienced international freight loading company will lock, brace and secure your cargo in appropriate size of 20’ or 40’ ocean freight container and deliver it to the sea port of international container shipping. Using warehouse FCL service for your international goods transportation is one of the most convenient and efficient way of container shipping full container load household goods. This method will help you save some funds on the inland pre-carriage cost of the international shipment. 4. Port Delivery / Ocean Freight Only FCL shipping – This kind of FCL shipping is available for freight forwarders and shippers highly experienced in international full container load shipments. The shipper is completely responsible of obtaining permits for pier or rail yard access, inland container transportation, loading and returning the loaded sea container. Any detention, roll over charges related with the shipment are entirely shipper responsibility. Choosing Port delivery FCL method, no port of origin or pre carriage charges will be included in the offered rate. Demurrage / Detention on ocean freight shipments. When the ocean vessel with your export FCL full container load approaches the destination port the Consignee will receive arrival notice by fax, mail or phone call. Once received the import notice you should act promptly. Your freight full container load free storage time at destination ocean port is limited. Depending on shipment terms and port of arrival free times at destination varies between 3 and 10 days. Thereafter demurrage/storage charges will apply and this can increase your sea FCL shipping cost substantially. If consignee is not familiar with the import cargo procedures we recommend them to contact immediately international freight forwarding agent or custom broker at destination to prepare and organize the import FCL cargo release on your behalf. In such a way you can avoid demurrage / storage charges on your sea FCL cargo shipment and you can obtain quick custom clearance and warehouse release on your FCL container import. Detention: Do not mistake this charge with Demurrage / Storage at container yard even though often is applied together. When sea FCL container arrive at sea port of destination Consignee has a limited time to take and return the full container load back to the port. If the Consignee detained the return of the FCL shipping container detention charge will apply. Demurrage / Detention charges should be considered if the final destination of the cargo is far away from the port of arrival or warehouse space and equipment is improper for the cargo shipped. In order to avoid demurrage/detention we recommend unloading the cargo from the ocean freight full container load, and reloading it to the truck or wagon and further transported to your final point of delivery. Or simply you can purchase your own container and ship ocean cargo in shipper owned container. Door to Door international FCL shipment of ocean freight container is entirely organized by our professional team. At the time of the container cargo loading you should provide us with the required documents for the international FCL cargo shipment / Invoice, Packing List and Shipper Export Declaration Titles, Certificate of Origin etc / and our experienced personals will arrange everything else necessary for your intermodal transportation overseas. Your ocean freight FCL shipment will be loaded at shipper facility, transported by truck, rail or both to the port of loading and ship further to the designated port of arrival. We will prepare and file US export customs declaration (AES) on your behalf and provide you with needed export/import documentation support. Your FCL cargo will have a unique tracking number and you will be able to track it at all the stages of the international container shipping process. When your FCL cargo arrives at port of destination, our professional customs brokers will arrange all the necessary paperwork to facilitate custom clearance and further transporting the sea freight full container load to its final destination. Door to Port ocean FCL transportation is one of the most popular multimodal transportation. Before shipping your cargo, make sure is well pack, palletized, crated etc. The empty container will be picked up from the container yard /CY/ and deliver it to your loading location. We provide 2 hours free time of loading at shipper facility and each additional hour comes at extra cost. When the cargo is loaded will be returned to the loading pier by truck, rail or both and loaded to the ocean carrier. Meanwhile the shipper should kindly provide us with all the necessary shipping documentation -/Shipper Export Declaration, Invoice and Packing List, Titles, Certificate of Origin etc. / related with the cargo shipment. We will notify you when your FCL cargo arrives at destination port and provide you with custom clearance broker to release and further facilitate your full container load cargo. Port to Door FCL transportation is often used by companies selling cargo to international customers and arranging own delivery to the port of loading. Most of the time such a companies have their own logistic network for delivering, loading and transporting the sea freight containers. Usually such companies including the transportation cost to the port of loading in their invoices /Free on Board/. Exporting on FOB terms saves the customer all the inland transportation headaches and expenses related with cargo transportation to the port of loading. We strongly advise customers using port to door FCL service to check and confirm with the shipper and the warehouse the proper sea FCL container size, cargo dimensions, weight, packing list, harmonized code and file the export customs declaration on time. You should provide us with the verified information and final point of FCL cargo delivery. We can provide all the necessary documentation support and professional export/import consultation related with your shipment. We can help you avoid all hurdles and obstacles related with your international shipment overseas. When your ocean FCL container is delivered to the port of loading it will be loaded on the ocean vessel carrier and sail to the nominated port advised by you and further transported to the final destination. Customer can track the international FCL shipment in all the stages of the transportation process. Once the cargo arrives we can assist with experienced custom clearance broker in order to help you moving your cargo to the final destination. Port to Port FCL shipping is for exporters and freight forwarders with good knowledge and experience in ocean freight full container load transportation. Choosing port to port FCL delivery can save you some money over the whole international container shipping process but at the same time requires constant cargo transportation monitoring, arranging the inland transportation, export/import documentation filling, shipping schedule etc.